Looking for a back-end development company to give your app a boost in performance and security? Let Mitrix take the floor. The heart of your application, the back-end is what can make it or break it in terms of both your business goals and your audience buy-in. We are here to ensure its ultimate performance, low-latency data processing and security, all through the power of our refined tech stack. We provide powerful and functional backbones for web applications, making use of the frameworks to optimize your TCO. This includes infrastructure and architecture setup with attention to scalability and maintenance costs. Feeding on our mobile development expertise, we create intelligent back-ends for native and cross-platform apps. We’re smashing at REST API integration and can also easily expand your horizons through MBaaS platforms. Public, private or hybrid clouds — we’ve got you covered here. We’ll take care of your cloud migration strategy to match your needed capacity and set up a highly elastic architecture for efficient and secure data storage. Whether it’s back-end mobile app development or the one for your web app, we can pitch in to deliver it from scratch or take your legacy back-end and refactor it. Either way, your back-end is going to spark up your app performance and make it highly resilient to peak loads. We’ll pair up with your front-end team to create a fully custom back-end and make all of its layers serve your product well. We’ll give your app back-end a new lease of life through skillful reengineering. No worries – we’ll wrap it all up without interrupting a whit of your app performance. 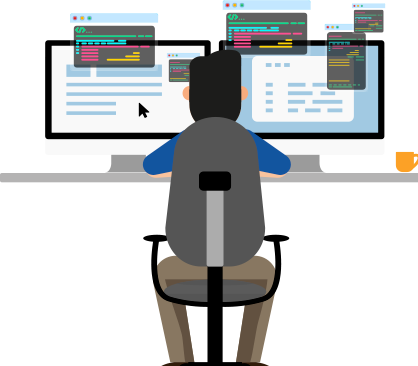 On-premises or in the cloud, for web or mobile, we raise productivity and cut your development costs through both public and private APIs. Count in our competencies in API development, deployment and management. Whether your app is for internal use or market release, we introduce fool-proof identity protection, including encryption, two-factor authentication and permission-based authorization schemes for advanced security. From push notifications triggered by a user’s geolocation to built-in messaging features, we enable real-time personalized communication that thrives on smart business logic. We know that no app can operate in a vacuum. That’s why our back-end development company provides integration services to make your internal systems communicate with each other flawlessly at all levels. With our mature back-end development expertise, we ensure unfettered data exchange in complex interconnected networks. This includes real-time data synchronization and interoperability between systems and devices. We have a knack for building resilient cloud and on-premises storages for both structured and unstructured data. With this, we are ready to help you tackle big data and business intelligence challenges posed by today’s market. To jumpstart our cooperation, send us a simple request outlining your particular project requirements, expectation and budget. From here on, we’ll start ramping up your dream team. At this stage, you go through the list of back-end developers for hire, complete with their CVs and test assignments. We are open to both on-site and remote interviews. Once your remote team is all ramped up, you can get ready for the take-off while we stay responsible for all the HR-related matters, project orientation and equipment. Congrats on your project launch! Now sit back and watch your back-end take shape, all with regular status updates and reporting on the progress to keep you in the loop.